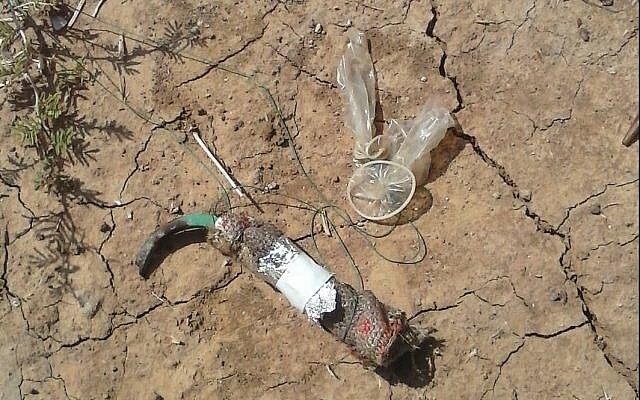 Police sappers on Thursday disarmed an incendiary device flown into Israeli territory from the Gaza Strip using inflated condoms. The device, constructed from flammable materials attached to two condoms, landed in a community in the Shaar Hanegev region of southern Israel. In a statement, police said the device was disarmed safely and did not spark a fire. In the nearly three months of Palestinian demonstrations along the Gaza border, protesters have hurled grenades, improvised explosives and rocks at soldiers, burned tires and flown incendiary kites and balloons into Israeli territory, sparking hundreds of fires. The blazes in recent weeks have destroyed hundreds of dunams of forests, burned crops and killed wildlife and livestock. Some of the balloons flown over the border recently were armed with small explosive devices, which seem to have not yet caused injury because of repeated warnings by police and local government officials not to approach them. 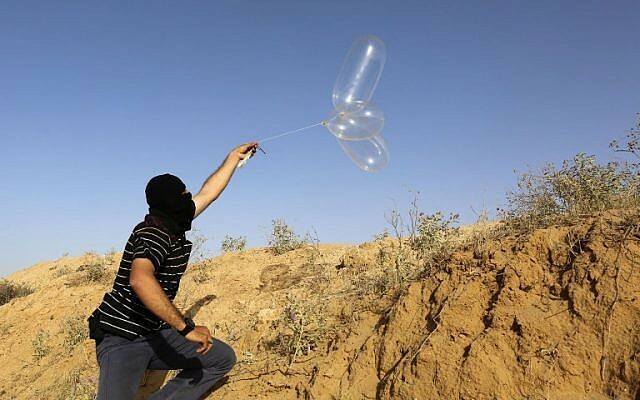 These “arson balloons” have presented a significant challenge to the IDF, who up until recently had been using drones and other high-tech solutions to stop the increasing number of devices flown into Israel. When the high-tech solutions failed to stop the kites and balloons coming across the border, the IDF started firing warning shots at those launching the devices. 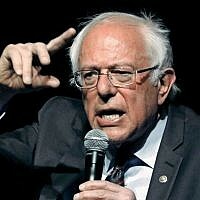 After this tactic also failed to yield results, the army shifted its focus to the Hamas terror group, which rules Gaza. 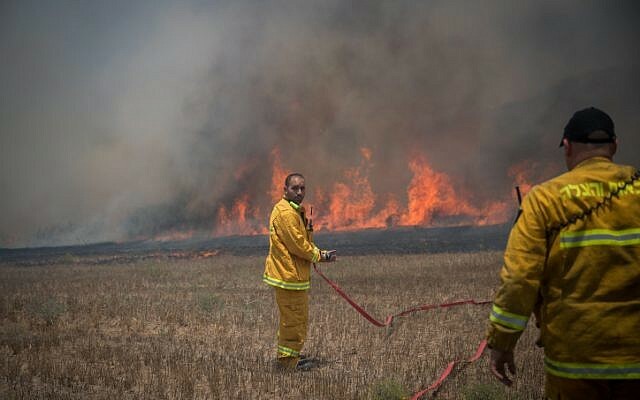 Early Wednesday morning, Israeli planes targeted Hamas military positions in response to the ongoing arson attacks. Palestinian terror groups retaliated for the strikes, launching more than 45 rockets and mortar rounds towards Israeli territory. In response to the launches, the IDF carried out more raids against 25 Hamas military targets in the Strip. The latest spike in tensions marks the worst military escalation between the sides since the 2014 conflict. 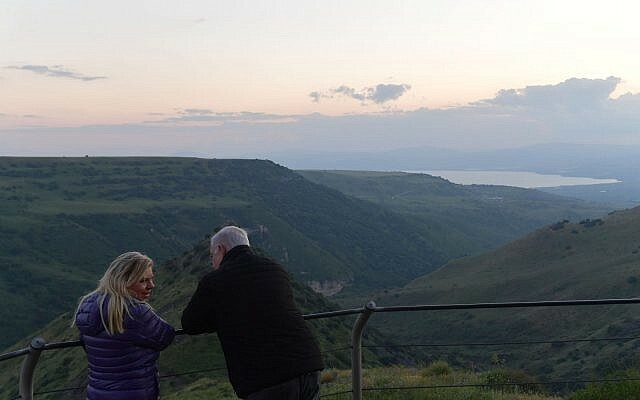 Prime Minister Benjamin Netanyahu and other lawmakers have indicated that Israel could step up its military action in Gaza if terrorist groups there continue to launch rockets and incendiary kites and balloons into Israeli territory.